There are different ways to hold a conversation. I am using several platforms/methods to hold a conversation with the faculty of the Shore, Church of England Grammar School from Sydney, Australia. 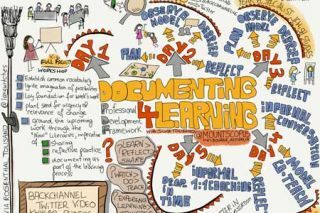 Our topic is documenting FOR and AS learning. We are somewhat “flipping” my school site visit (scheduled for next June) and are using several of the below mentioned platforms/methods and resources to start the conversation around documenting for learning, build common vocabulary and understanding and plan for our face to face time together. I invite you to join the conversation by reading, commenting and sharing your thoughts and work if you are interested in documenting for/as learning! We can hold a conversation face to face, although we are limited to talking with people who are physically in the same room and present at the same time to hold that conversation. We can hold a conversation through text exchange via letters, emails, text messaging groups, collaborative documents, chat rooms, backchannel platforms or on a blog via comments. We can hold a conversation via audio, such as a telephone call or web based/mobile audio calls. We can hold conversations via a video conference platform with people who are not able to be in the same physical location, but can connect at the same time to see each other’s facial expression. Stay tuned for the documentation of the on-site visit.